The first Porsche road car was the 356. It became available to the public in 1948 and it lasted through 1965 via a number of different series and limited edition models. The Carrera 2 was one such limited edition model that was introduced at the Frankfurt Motor Show in 1961. The engine is a 2.0-liter (thus the “2” in Carrera 2. And Carrera, of course, refers to the Carrera Panamericana road race) flat-4 making an impressive 130 horsepower (that’s 15 more horsepower than the next-most-powerful 356). This was the fastest 356 road car ever built. The car you see here has a factory-installed electric power sunroof and an expanded 70-liter fuel tank. This car has had many owners of the years and the mechanicals were freshened in 2011. Only 436 examples of the super quick 356 Carrera 2 were built and this is one of the nicest, best-optioned examples in the world. It should sell for between $550,000-$650,000. Click here for more info and here for the rest of Gooding & Company’s Amelia Island auction lineup. 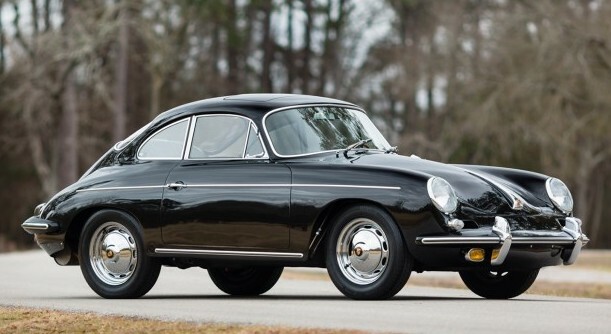 This entry was posted in Uncategorized and tagged 1963, 356, auctions, carrera 2, cars, classic cars, coupe, gooding & co, porsche by classiccarweekly. Bookmark the permalink.